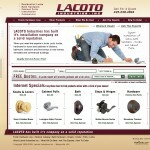 We first built Lacoto a static Website for their Finish Hardware Installation services. The goal, via SEO keyword strategy, was to drive traffic to the install quote form. 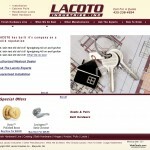 We later designed and developed a Bigcommerce store for Lacoto to sell Weslock parts. As an authorized Dealer of Weslock products Lacoto Industries needed a Bigcommerce Designer to create a full-blown Lacoto store to sell Weslock parts online. First a HTML site was setup taking Paypal orders to test the waters and SEO. 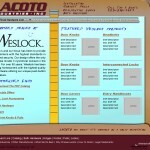 A few years later we design a full-blown Lacoto Bigcommerce store to sell Weslock parts online. We started the engagement with a face-to-face meeting to review the Webvisuals Content Grab document that was created from a list of client-recommended competitor sites. We talked about what we liked from each of the competitor sites and where Locoto Industries strength lie in the finish hardware marketplace. Ron, UI/UX Director at Webvisuals went back to studio G. to dive in. Thank the internet gods that domain lacoto.com was available so we quickly snapped that up. 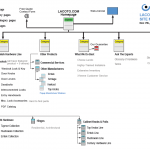 A Lacoto site map, wire-frame(s) mock-up(s), and content outline(s) were used to get the Information Architecture (IA) and content placement dialed in as we were building the Lacoto.com website. SEO strategy was combed through the IA and a keyword-laden HTML static site targeting” finish hardware installation” and “Weslock parts” was built with some eCommerce links to Paypal embedded in. This was done to start the Lacoto Warehouse getting use to taking online orders. A couple years later George wanted to implement Phase 2 which was design and build store.lacoto.com. We whole-heartedly recommended the Bigcommerce platform after researching the latest shopping cart technologies and having been in the eCommerce worksphere since 1999. We then designed the Bigcommerce theme that made the user experience seemless as they traversed between the installation side of the business versus the eCommerce side while the Lacoto staff entered product descriptions and images. A keyword strategy was developed for Bigcommerce as well tying current organic traffic with new traffic developed by the eCommerce site. At one time they showed on the first page in Google for the keyword “Weslock Parts“. We wanted to take advantage of our Authorized Weslock reseller status and met with Ron of Webvisuals for ideas on getting our business online. He came back to us with a plan to build a website to promote our installation side of the business then build an eCommerce store to sell our extensive inventory of Weslock parts.